All Tobi wants is to help her friend Carter, she never knew what a can of worms she was opening. Fiona was making hairdresser Carter McDade’s life miserable. She thinks she is a talented actress and he doesn’t agree and let’s her know it which gets him in hot water at the theater. Tobi decides to hire Fiona for a commercial to try and smooth the waters much to the displeasure of the person she had already promised the part. Fiona arrives on set and makes a horrible impression. 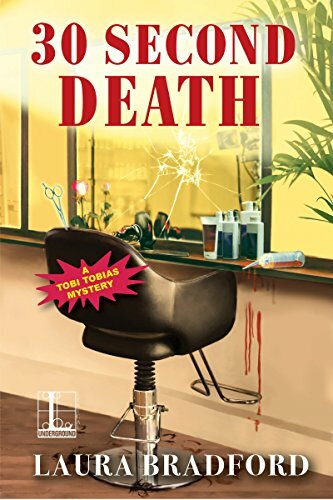 When the actress is found dead after a break everyone on the shoot quickly becomes a suspect but Carter is the prime suspect especially when they learn the hair dye he was applying may be the murder weapon. I was excited to visit again with my literary friend Tobi Tobias, she and I have a couple of things in common, like an unusual laugh and our diets. She has a huge heart and went way beyond the limits to help Carter this time. Not sure I would have done the same thing. Alive Fiona was a ticking time bomb that started to explode immediately when she tried to tell everyone how to do their jobs. Even if she hadn’t died she could have ruined the commercial and the reputation of Tobi’s firm. On the romantic front for Tobi, what started looking hopeful in the first book really hit the skids in this one. Mary Fran is also having problems at her pet shop with a neighbor and she ends up with a huge surprise. So murder, romance drama and an upset neighbor. Tobi has her hands full. But my favorite part was Grandpa Stu returns to help clear everything up. These are a superb group of characters. It is so easy to become invested in their lives. Ms Bradford presents a wonderful plot with an unusual murder weapon and one that hits very close to home for me. Had I been in Fiona’s position I would have been dead too. She gave a a plethora of suspects and they all had the means and after spending time with Fiona motive was spread around liberally. I was totally surprised when the real culprit was revealed. I really enjoy this series because it gives me everything I want in a cozy mystery. She also includes those moments that make me laugh out loud and would have Tobi snorting as well. This story is fast paced and a quick read. I do recommend that if you haven’t read Death in Advertising , start with that one first as this one picks up where that one left off. Just stumbled across this, Lori! So glad you enjoyed 30 Second Death! Flashback Friday – Murder on the Rocks by Allyson K. Abbott #Review / #Giveaway @KensingtonBooks #Review / #Giveaway – Bring Her Home by David Bell – Released Today! !